Charity asks what's wrong. 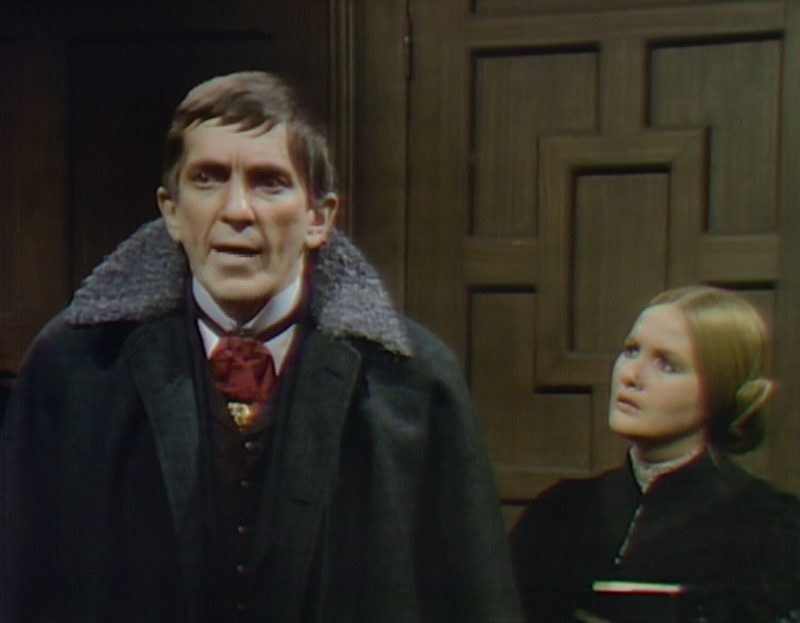 Barnabas says that woman, referring to Laura, has been dead for over 100 years. Charity says he must be mistaken. 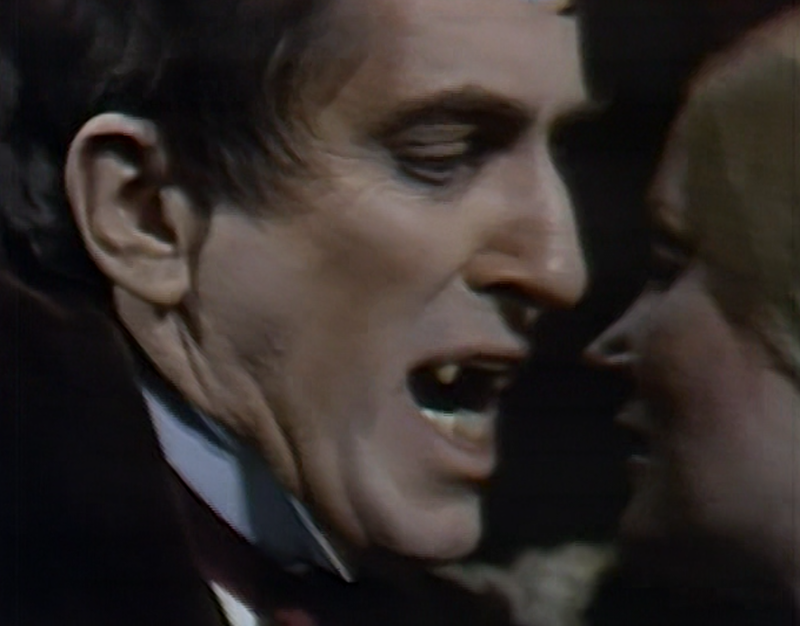 Barnabas says he has lived many lives and seen many people, and Laura is much more than she seems. He asks Charity to stay at Collinwood during the day, and to come see him at night at the old house to help her find out who is Laura Collins. Charity says she's frightened, and he tells her there's no need to be frightened when he's near. 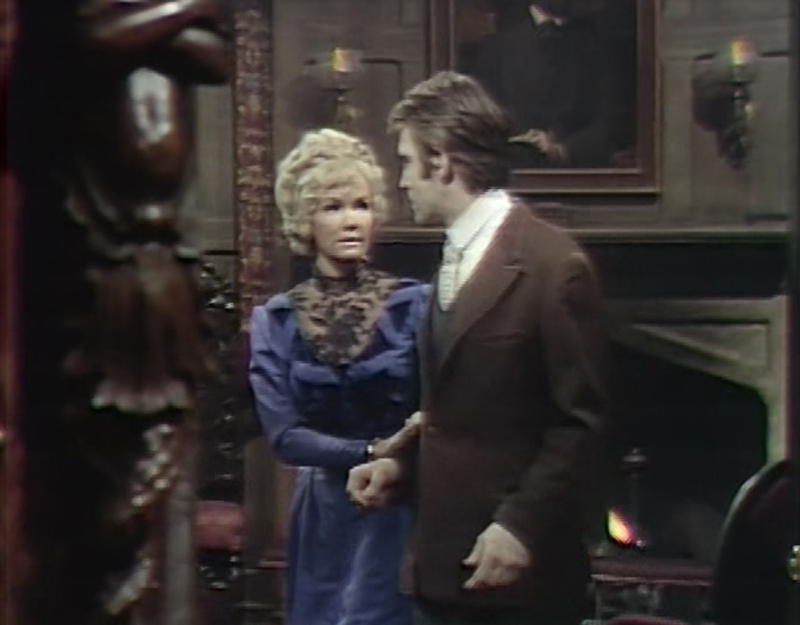 He opens the door and Angelique walks in. She recognizes Charity, who does not know who she is. 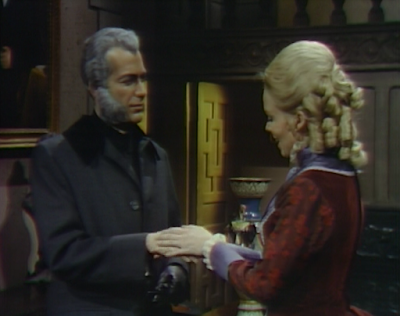 Angelique explains that she is Barnabas' fiancé. Charity runs upstairs, ashamed. Angelique says she's surprised his taste in women hasn't improved. She says Trask can be nothing but trouble. 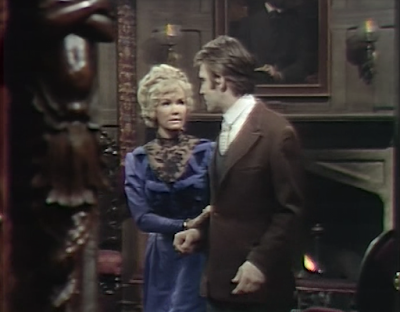 They discuss Charity's ancestor, who tried to kill the witch 100 years ago, and who Barnabas walled up in the basement of the old house. She reminds Barnabas that he's here to save David. He says if she's concerned about him, she should undo what she did to him, and make him human again. She tells him to spend his time with girls down at the docks. Charity has a dream, in which Angelique comes to visit her. She explains that it's Charity's wedding day, and she's there to help her get ready. She shows her a black veil, and Charity says a veil mustn't be black. Angelique explains that it must be black when marrying death. Reverend Trask oversees the ceremony, with Charity present, but rather than matrimonial ceremony, he recites a burial ceremony. She pleads to her father, saying that she's not dead. Angelique explains that she is dead. Charity says she loves Tim, and that she's not dead. Angelique explains that Charity is not dealing with humans. 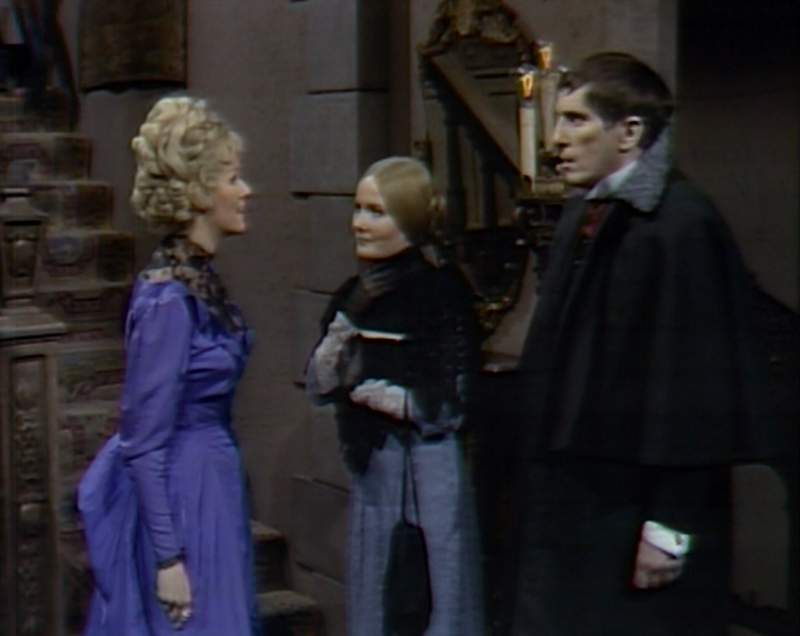 She turns to see Barnabas, with fangs bared. He is replaced with a fanged skull, at which Charity screams while Angelique laughs. Charity wakes up screaming. The next day, she's still asleep in bed when Judith comes in to check on her, explaining that it's four in the afternoon. Judith opens the drapes and Charity recoils due to the light. She says it hurts her eyes. Judith says it was good she brought Jamison back, but she should rest until her father arrives. Judith goes to put a black wrap on Charity, who sees a resemblance to the black veil in her dreams and tells her to take it away. 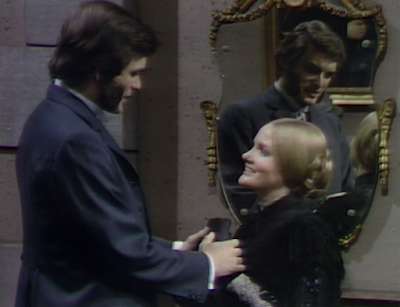 Trask arrives at Collinwood and meets Angelique. 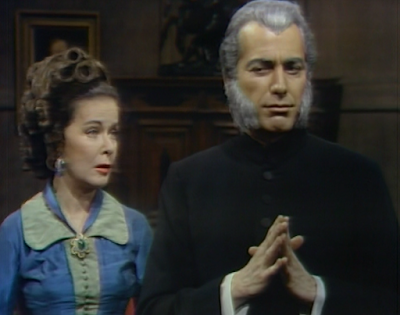 She introduces herself as Barnabas' finacé. She tells him that she knows about his daughter, and she should be married off as quickly as possible. She excuses herself as Judith comes downstairs. Trask is surprised to hear that Charity is still sleeping this late in the day. Judith explains that she's not feeling well. They retire to the drawing room and discuss the fire. Trask says he will rebuild, and Judith offers to help. She also offers a house on the property to be used as a temporary school. He is touched, and she explains that she's only offering money. He says that she must realize that money does not provide all the rewards she would wish. He says he recognizes her needs in making this generous offer. He says that there are problems in her heart and soul which he will help her with. She says that she admires him for not complaining, despite his ill health. He asks what she means, and Judith says his wife told her. He counters that his wife is the one who is in ill health. Barnabas rises from his coffin and calls to Charity. As they are about to enter her room, Judith explains to Trask that Charity was pale and lethargic. Inside, they find her bed empty. Charity visits Barnabas in the old house. In the basement, he shows her a trunk that belonged to Jeremiah Collins. 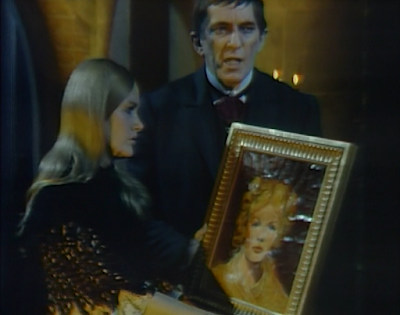 He pulls out a portrait of Jeremiah's first wife, Laura Stockbridge. Charity looks at it and says it's the same woman. Barnabas describes her arrival at Collinwood, and how at 10 years old she was the most beautiful woman he had seen. He mentions how she died by fire. Charity says they all frighten her, and she must leave. He convinces her to stay, and says they must find out if Laura Collins is the same woman as Laura Stockbridge. Judith tells Trask that if Charity is gone, it must be because she's in shock. Trask says that no one is immune from evil. He adds that Angelique told him that he should watch his daughter. He says she's always been a perfect child, but that may have been the Devil's disguise for what lurked inside her. Judith suggests several explanations why she might have gone, when Charity walks through the door. Her father interrogates her, and she faints. They observe two bite marks on her neck. 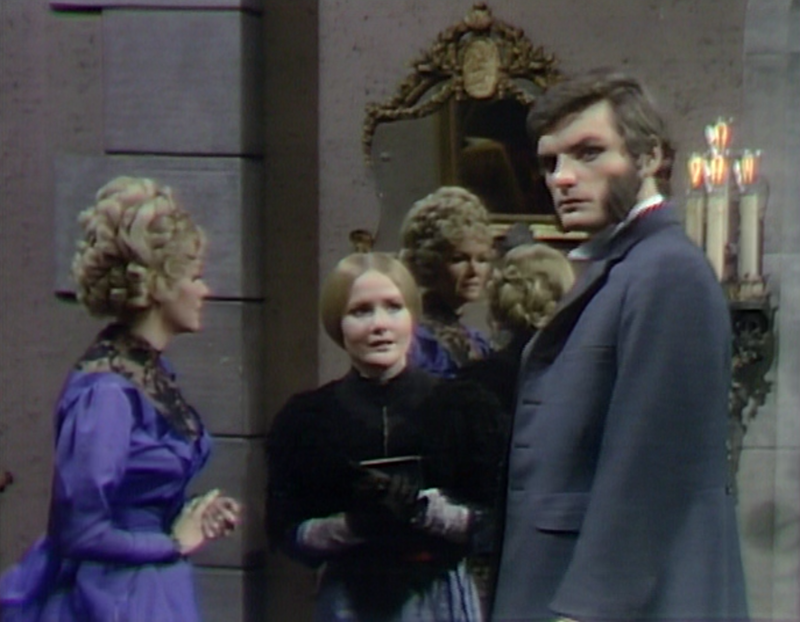 John: Funny how Angelique tries to steer Barnabas away from important people, and suggests he focus on whores down by the dock. Is that the life of a vampire's wife? Christine: If she truly loved him, she'd make herself the blood donor, and then he wouldn't have to resort to dockside women. Even Julia offered her neck to him. 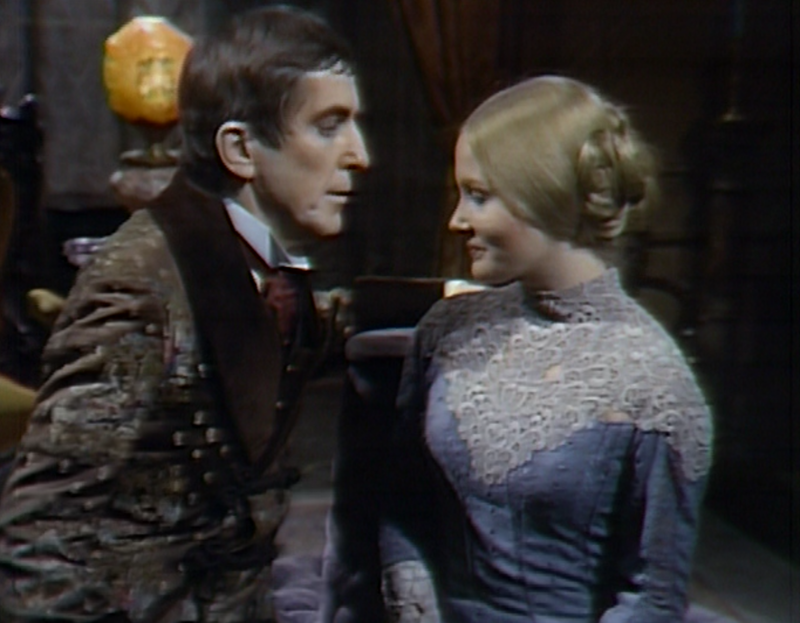 I do have to wonder Barnabas' purpose in playing romantic vampire to Charity. 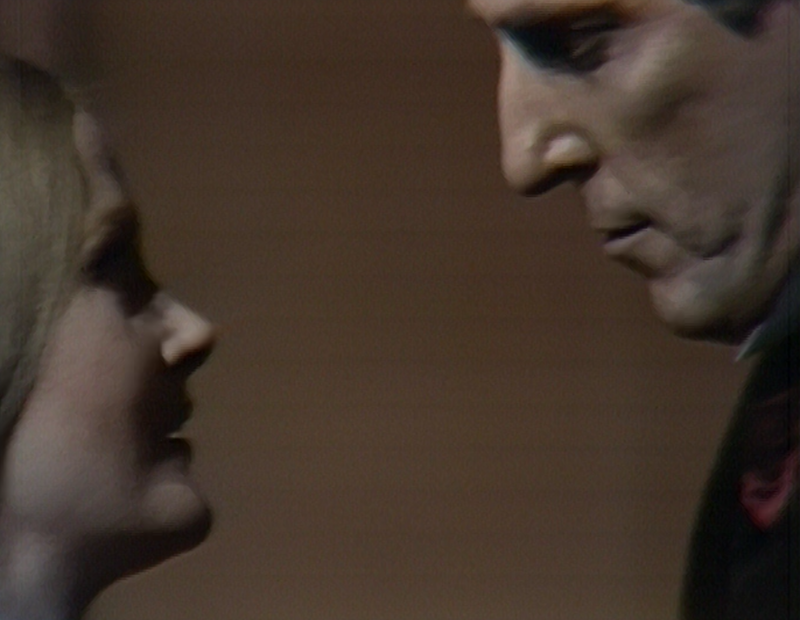 I thought he was manipulating her to get at Trask, but that does not seem to be the case. It only serves to remind us of his unnatural liaison with cousin Carolyn. John: Look who's back! Looks like our old pal the wide-eyed skull has had some dental work done! 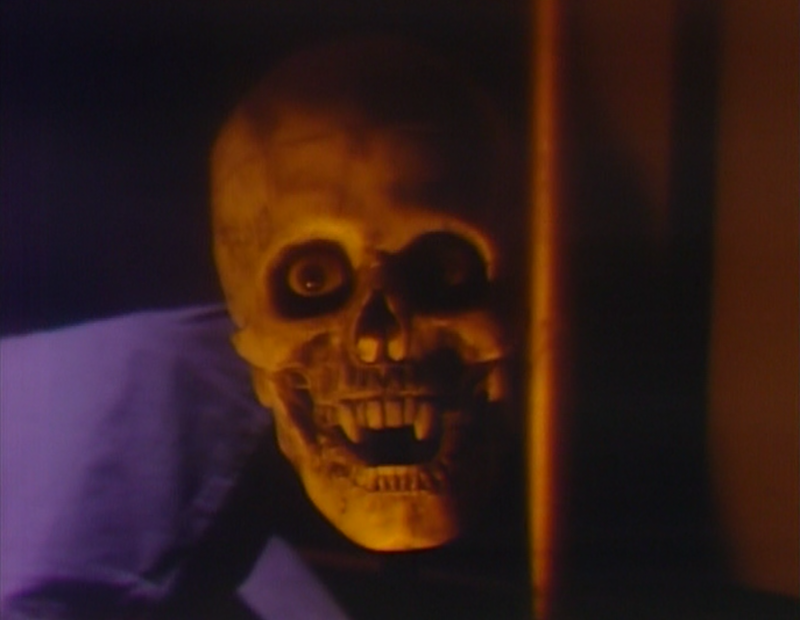 I tell ya, there's no such thing as a bad episode when the skeletons show up in any way, shape or form! Christine: The wide-eyed skull has never looked better! 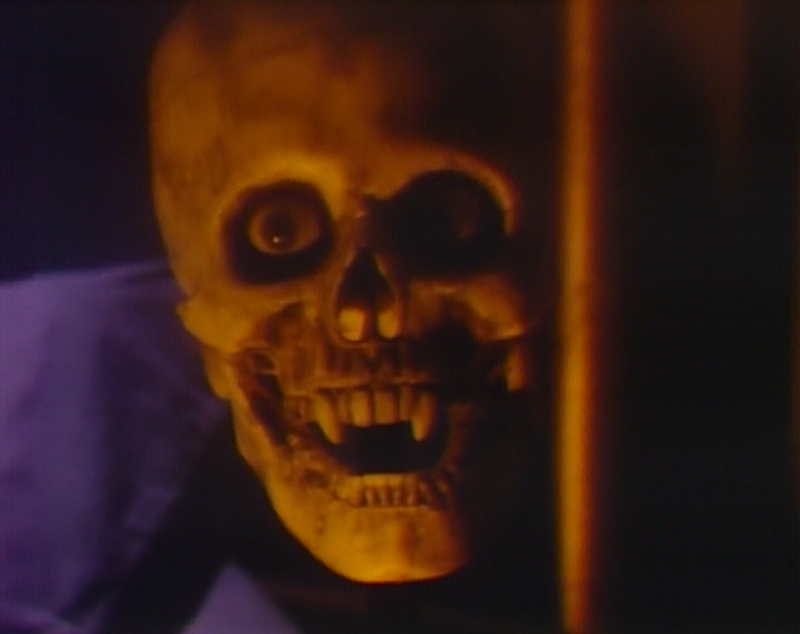 This has got to be the first time a vampire skull has been seen on TV. That was superb! John: Is this the first we've heard of Jeremiah's having a wife prior to Josette? I'd write it off as my own bad memory, but I've come to believe that the writers will assume that we haven't been paying attention, and will retcon anything they see fit. Christine: I believe it is the first we've heard of Jeremiah's first marriage. In Episode 373, Joshua introduced Millicent to Jeremiah and suggested he marry her for her valuable estate, which he declined. I don't recall it being stated either way if he was a widower or bachelor, though I assumed the latter. Laura fears she's going to die. Dirk comes into her room. He says he doesn't understand why he's speaking foreign words. She says he has the power to save her, and he says he won't let her die. She tells him to look deep into his soul and he'll know what to do. She passes out. He sits her up, and says a few Egyptian words. She wakes and says he does have the power to restore her with the flame of eternal life. He says he doesn't want to lose her. She begs for him not to let her die. 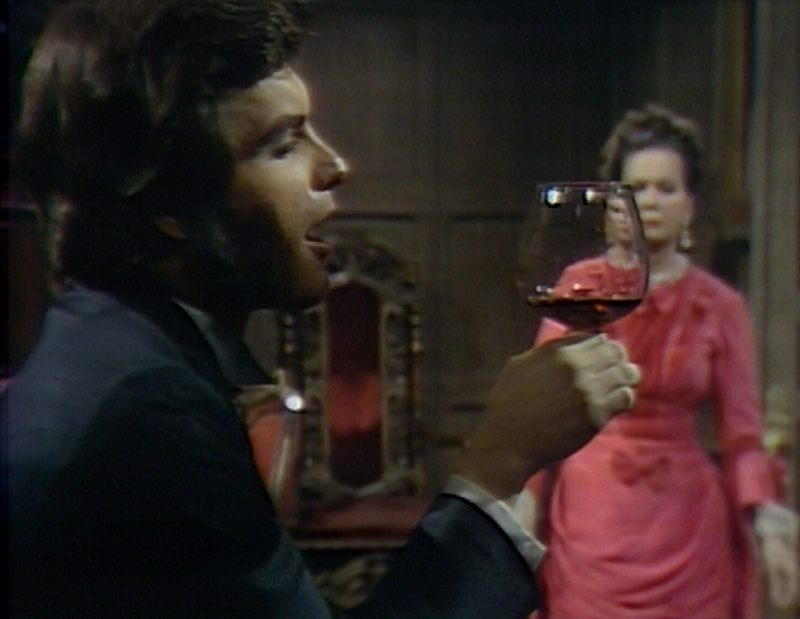 Charity returns Jamison to Collinwood. Quentin is pleased to see him. Jamison says he must go to his mother. Quentin explains that she's sleeping. He says he dreamed she was dead, and must see her. Quentin tells him to wake someone up to fix him some tea. Jamison runs off to do that. Quentin tells Charity that sometimes dreams provide a painful truth. He explains that there is something wrong with Jamison's mother. He asks her to help show Jamison that there are people in the world who care for him. She says he's lucky to have Quentin. He explains that he's committed all the sins that she's just read about. He says through Jamison, he has a second chance at redemption. She tells him he's not wicked. Quentin says that Laura may already be dead. From the top of the stairs, Laura laughs and tells Quentin that she never felt better. Charity is surprised, saying Quentin said she was ill. Laura explains to Charity that there's nothing wrong with her. Jamison comes in and tells her that he had a horrible dream about her. She takes him into the drawing room to talk. In the foyer, Quentin scolds Charity for interfering, and then apologizes. 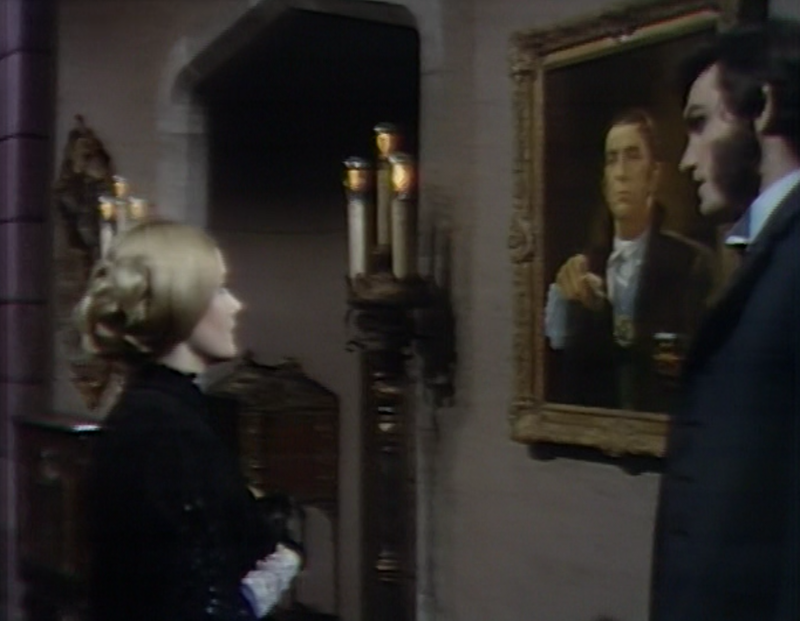 He notices she's transfixed by the portrait of Barnabas. She walks away from Quentin. Jamison tells his mother that he wants her to stay. She says someone in the house wants to hurt her. He says he'll one day be master of the house, and no one will hurt her. He adds that Quentin will help her if he asks. She tells him to get dressed for bed and then to come to her room. 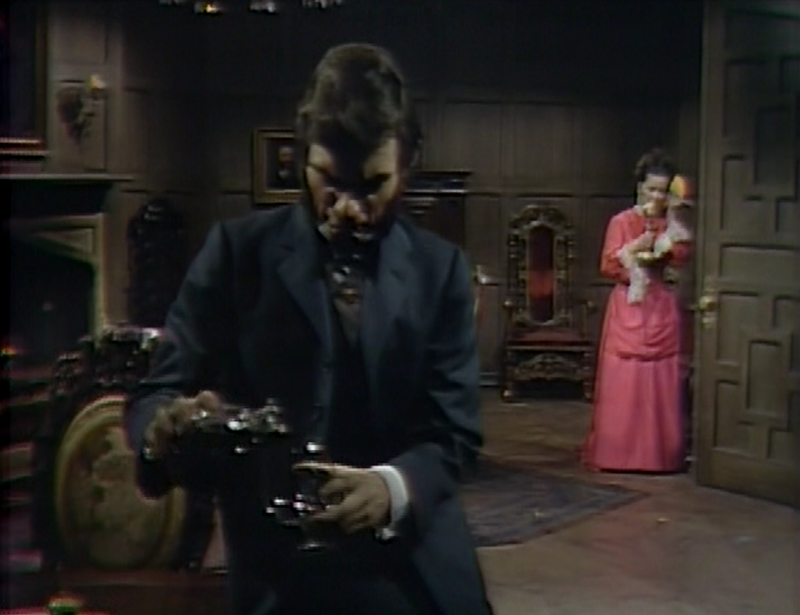 Barnabas is writing a letter when Charity comes to the old house. She says she's ashamed to come, but she couldn't stay away. She fills him in on events at the school. She adds that the fire gave her an excuse to come to him. She asks him for a mirror. He asks why, and she says that in his world, she feels beautiful. He tells her to look into his eyes to see that. Laura tells Dirk to ask Ra for the Scarab, which she needs to protect herself. He doesn't know how. She says he will summon it from the flames. Dirk goes Egyptian 101, and sees a Scarab in the fire. Laura picks it up as Jamison knocks on her door. He's surprised she's not alone. He dismisses Dirk. After he leaves, she asks why he treated Dirk that way. Jamison says Quentin taught him that servants must know their place. She tells Jamison that Quentin is the one who wants to hurt her. 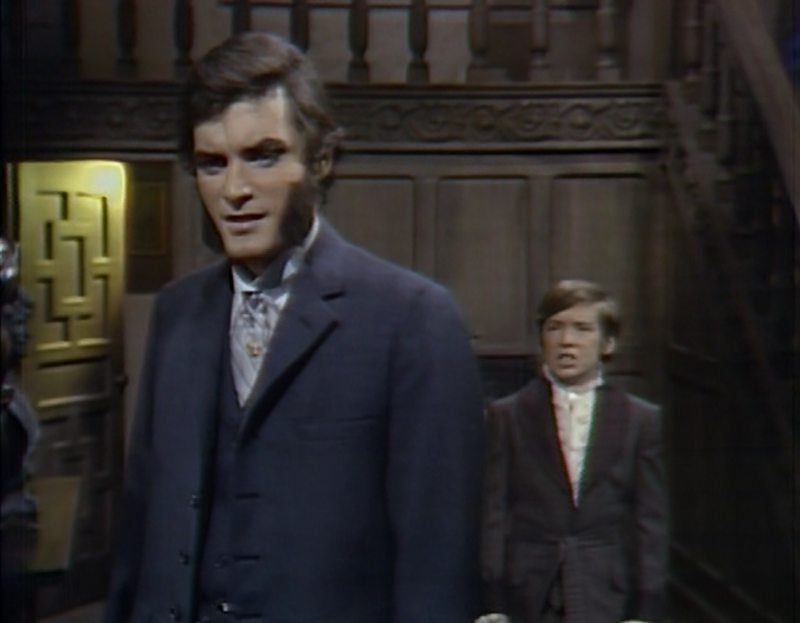 Barnabas says he'll take Charity back to Collinwood. 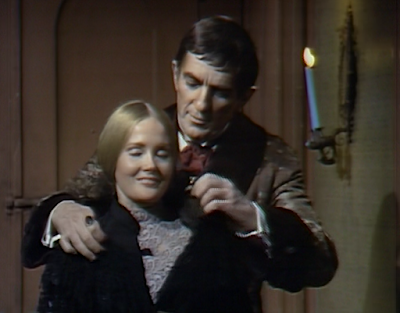 She says she used to like Tim, but now she feels compelled to do anything Barnabas wants in order to be happy. She asks him to make her happy, and he says he will, before biting her. Jamison comes downstairs. Quentin asks him what's wrong. Jamison points out that when he's master of the house, people will have to do what he says, including Quentin. He tells Quentin to get out of his sight, because he hates him. Quentin is confused. He asks Jamison why he feels this way. Jamison tells him that his mother says Quentin hurt her. Quentin tries to explain things to Jamison. Laura comes downstairs and offers to take Jamison to bed. Quentin says they need to talk. She sends Jamison upstairs, assuring him that she'll be safe. They go into the drawing room. Quentin suggests that he has befriended Jamison because of the way his mother and father behave. Laura digs in to Quentin, and as the argument escalates, Dirk comes in and starts to fight Quentin. Laura calls him off. Quentin sees what's going on between them and leaves. Dirk starts to make a move on Laura when Barnabas arrives with Charity. 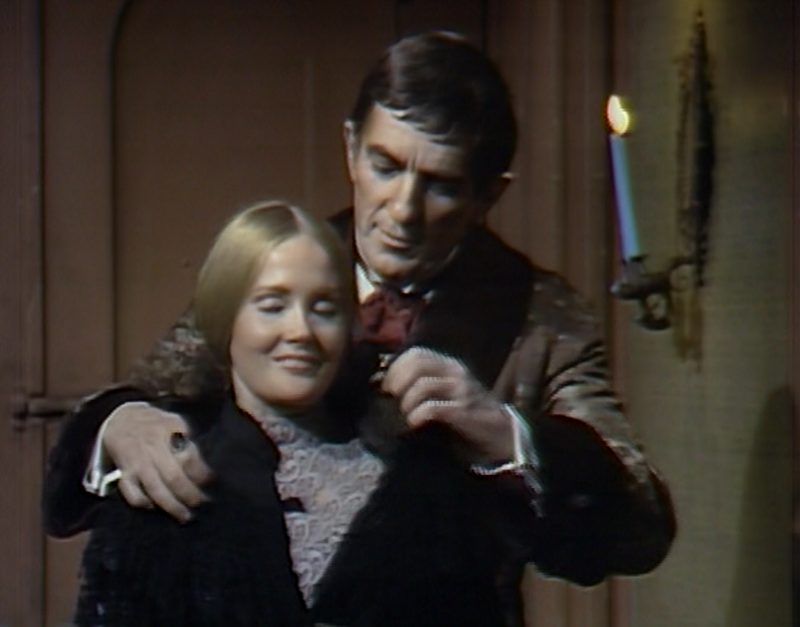 Laura introduces herself to Barnabas. He compliments her beauty, but behaves strangely. Laura goes upstairs. Charity asks what's wrong. 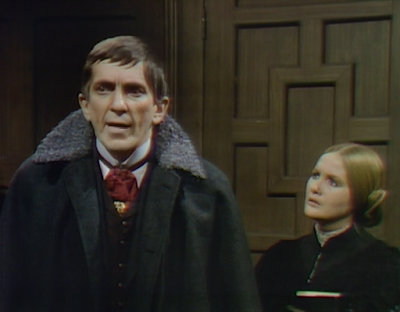 Barnabas says that woman has been dead for over 100 years. 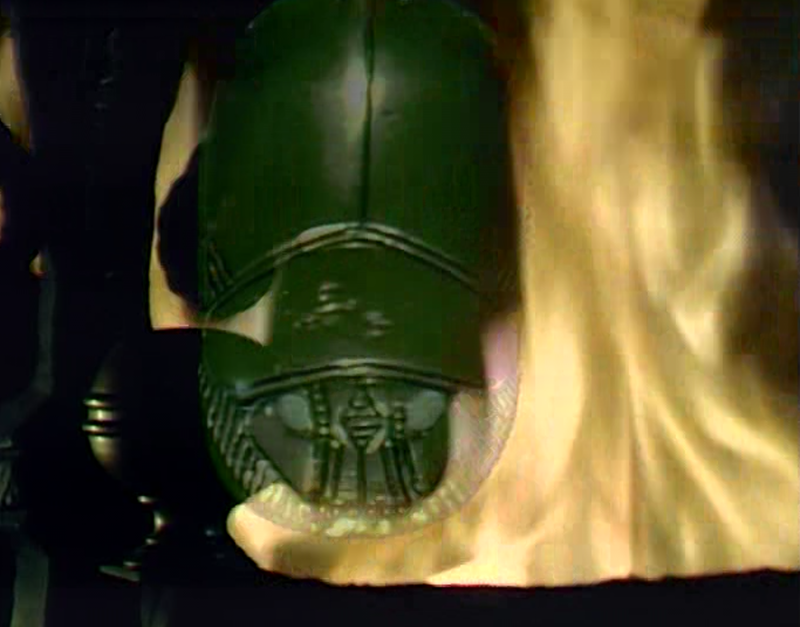 Christine: They know enough to include scarabs and the supreme god Amun-Ra, but I suspect they don't want to overwhelm the audience with too much Egyptian mythology. I was disappointed that Dirk didn't invoke Imhotep from The Mummy as I was hoping he would do. John: The Quentin/Laura dynamic is pretty heated. I have to say, Quentin does his best work when he's either playing a mute zombie or when in the midst of a heated argument. Christine: He is so good at being bad. It's easy to see that these two still feel passionately about one another. His dig about her cavorting with the hired help serves to demonstrate how jealous he truly is. Dirk giving Laura the 'flame of eternal life' offscreen would seem to imply it was part of some intimate ritual that is better kept out of our imaginations. His touchy feely familiarity with her in the drawing room would seem to confirm that suspicion. 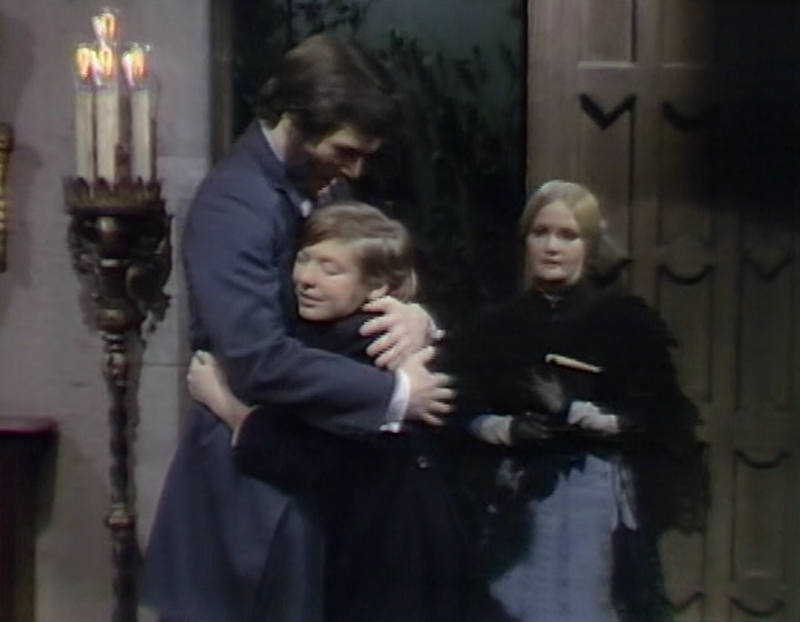 John: So Barnabas knew the previous incarnation of Laura Collins! 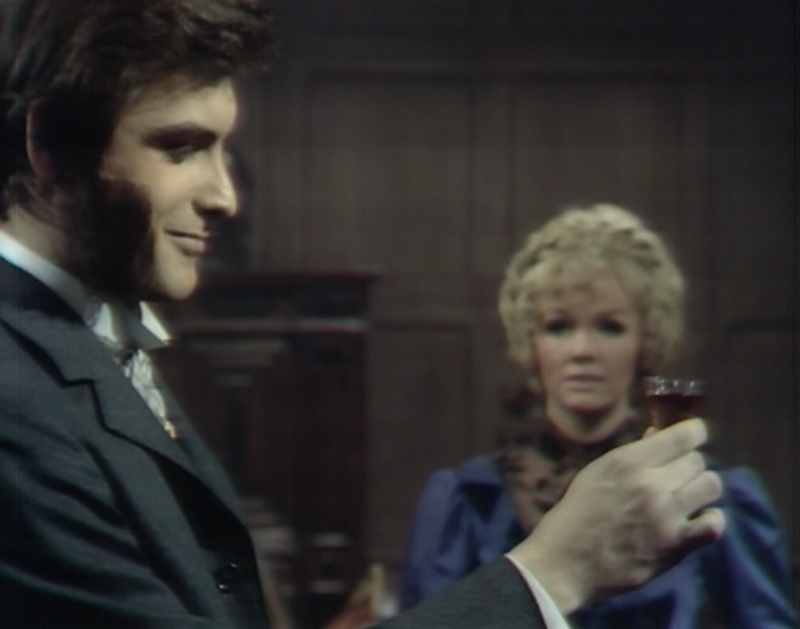 I wonder if we'll get another 1790s flashback to find out more about their relationship. 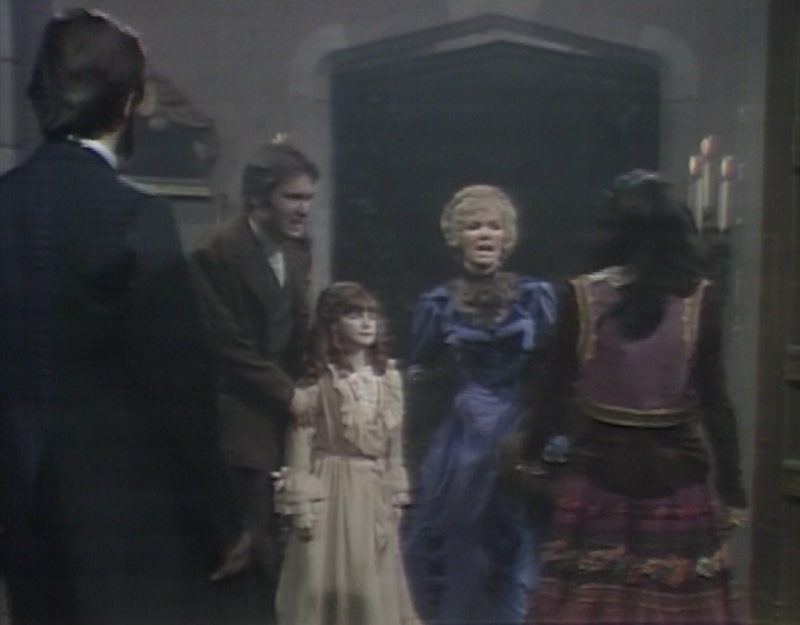 Christine: I do hope we'll get to visit Laura in another time period after this one. I have to wonder why she does not recognize Barnabas as he recognizes her. Only time will tell. Quentin searches the garden for the urn. He finds Laura's bracelet near a sculpture. 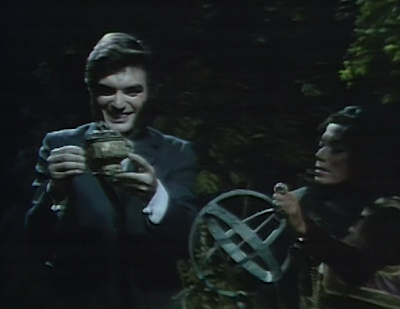 He picks up the top of it and finds the urn. He explains that it's a very valuable and precious thing, for it contains a flame capable of giving life. He adds that if it is snuffed out, a life will be snuffed out with it. He wonders how it will happen, and says they'll know soon enough. 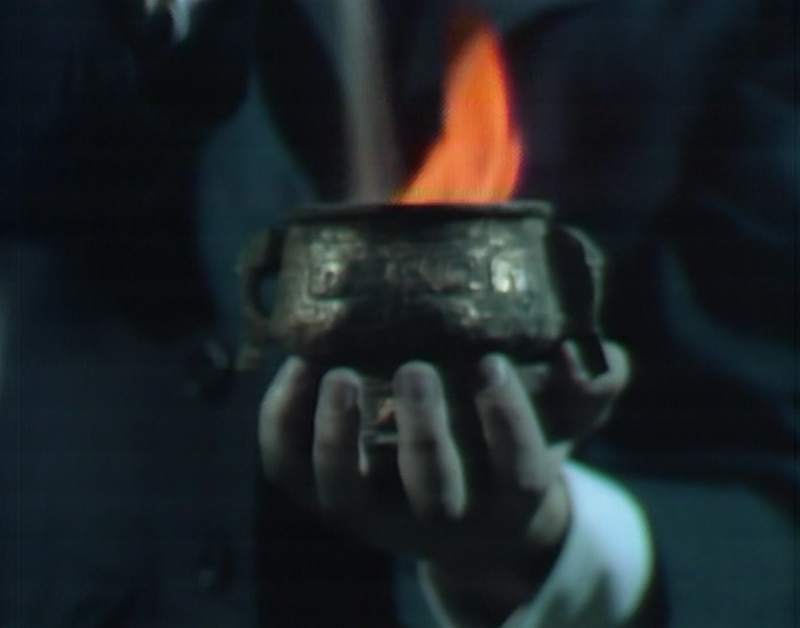 He pours sand onto the flame and says goodbye to Laura. In Collinwood, Laura squirms in agony. Judith comes downstairs and asks her what's wrong. Laura asks for some tea. When Judith goes to get it, Laura leaves, leaving the front door open. 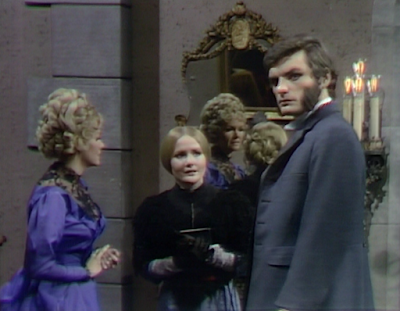 Quentin comes in and Judith asks if he saw Laura. She explains that Laura is very ill, and Quentin says she might just be melodramatic. He refuses to go out looking for her. He asks why Judith has had a change of heart about Laura. Judith says she's a human being, and Quentin calls that into question. Judith points out that Laura went into a burning building to save her child, something he would never do. Judith calls a doctor, and Quentin whispers that what she needs is an undertaker. Laura goes to the hiding place for the urn and finds it missing. Dirk finds her and asks if she's okay. She grabs him, telling him that she's terribly cold. 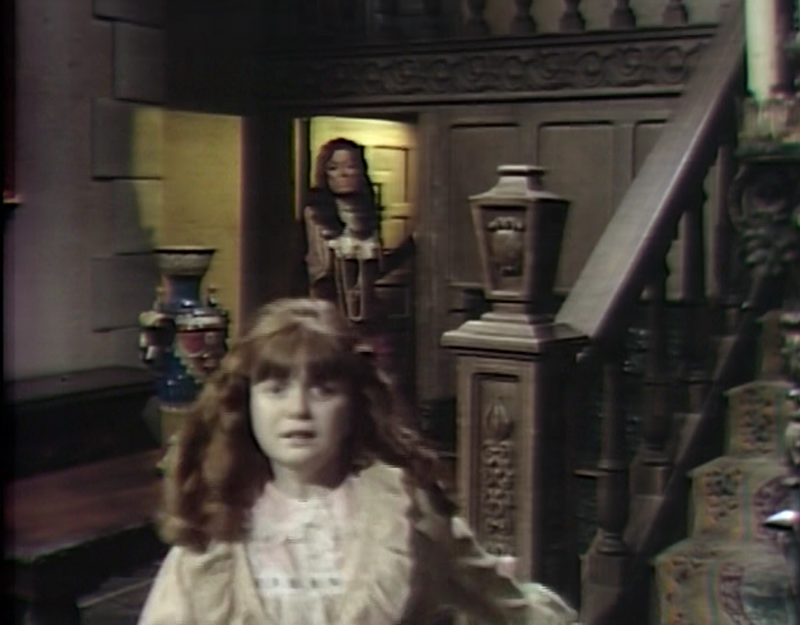 He says he has to take her back to Collinwood. She tells him he's lucky to have found her, as she'll be the one. He doesn't understand what she's saying. She says he'll come to her when she needs him. Dirk brings Laura into Collinwod. 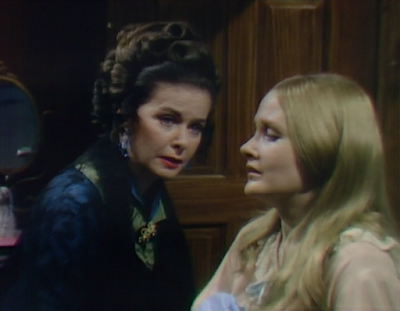 Quentin tells her that Judith has called a doctor, and offers to take her upstairs. 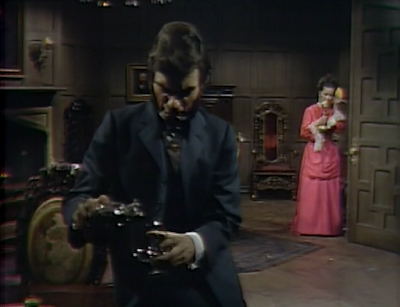 Judith asks Dirk go into the drawing room. He says he thinks Laura is delirious. She thanks him for bringing her back. Quentin helps Laura into her room, and onto her bed. He tells her to lie there and rest until the doctor arrives. He asks her how she feels. She says he already knows. She accuses him of doing this to her, and he feigns ignorance. She says he's trying to kill her. He asks if she can prove it. She tells him that he'll pay for this. He suggests that she doesn't have much time left. He brings up the other day in the cottage when they both thought he was dying, and she refused to help him. He intends to return the favor. He leans down, kisses her, and tells her goodbye before leaving her alone to die. Dirk asks Judith if the doctor came to see Laura, and she says that he did, but he doesn't know what's wrong with her. She sends him to do his rounds. Laura gets up and approaches the fireplace. She begs her master for help. 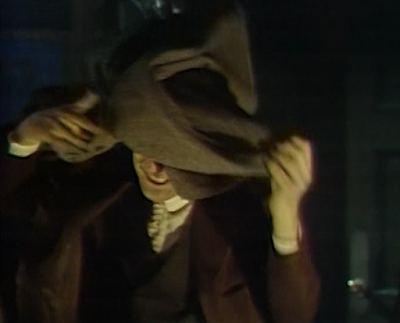 She asks him to appear to her in human form through Dirk. She pleas for him to possess Dirk. Dirk returns from doing his rounds, and prepares to put out the fire in the drawing room fireplace. He stops, seemingly transfixed by something. He begins speaking Egyptian. Dirk finds Laura passed out on the floor in her room. He picks her up and puts her on her bed. He doesn't understand why he's speaking foreign words. She says he has the power to save her, and he says he won't let her die. She tells him to look deep into his soul and he'll know what to do. She passes out. He sits her up, and she says that he does have the power to restore her with the flame of eternal life. He says he doesn't want to lose her. She begs for him not to let her die. John: Apparently Laura went to the same school of controlling vulnerable men that Angelique did. Still looking forward to the meeting of those two. Christine: Or you could say that Angelique went to the same school of manipulation as Laura, since she came first. 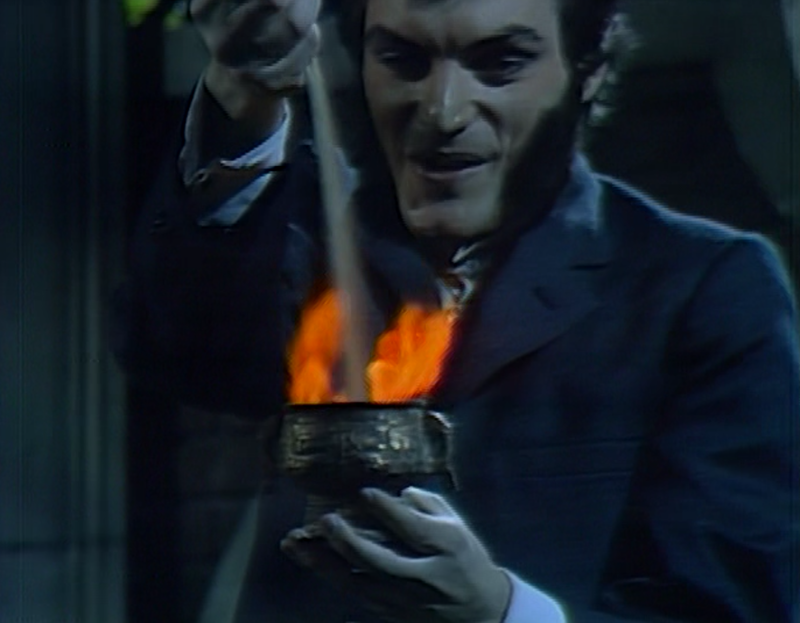 John: I did enjoy Quentin's toying with Laura as she withered away, though I'm a little disappointed that snuffing out her flame of life didn't have a more immediate effect on her. Christine: It was pretty gross the way he smooched on her, but oh so fun to watch him take delight in her suffering. I'm sure that won't go unpunished once she recovers. John: Dirk isn't always the most eloquent when speaking English—but an Egyptian Pharaoh he is not! Christine: It was a weak possession indeed. I suspect he will have to sacrifice himself to give her the flame of eternal life. That should be fun to watch. Nora is trapped, surrounded by fire. She sees her mother in the room, calling her to come to her through the flames. Nora cries out for her mother. Tim appears, and after wrapping himself in a blanket, rescues Nora. With Laura, they make it out of the house to see it burn. Laura asks about Jamison, and Tim tells her Trask already got him out. Quentin comes downstairs and tells Magda that he can't find Laura's urn. He asks her where Laura goes when she leaves. Magda says she's been to the garden, and also to the school. She questions him about the urn, and he reminds her that he's not paying her to ask questions. She asks if the urn is not worth money, what IS it worth. He tells her that it's worth Laura's life. Laura and Tim enter with Nora. They explain about the fire, adding that Jamison is okay, but they wanted to bring Nora home. Tim offers to take Nora upstairs. Magda brings Laura into the drawing room. Laura tells Quentin to notify Edward. Laura asks Magda to get her some tea. Quentin watches Laura from the foyer, and she asks Magda to close the doors behind her. After she does, Quentin tells Magda not to let Laura out of her sight, as she's going to lead them to the urn. 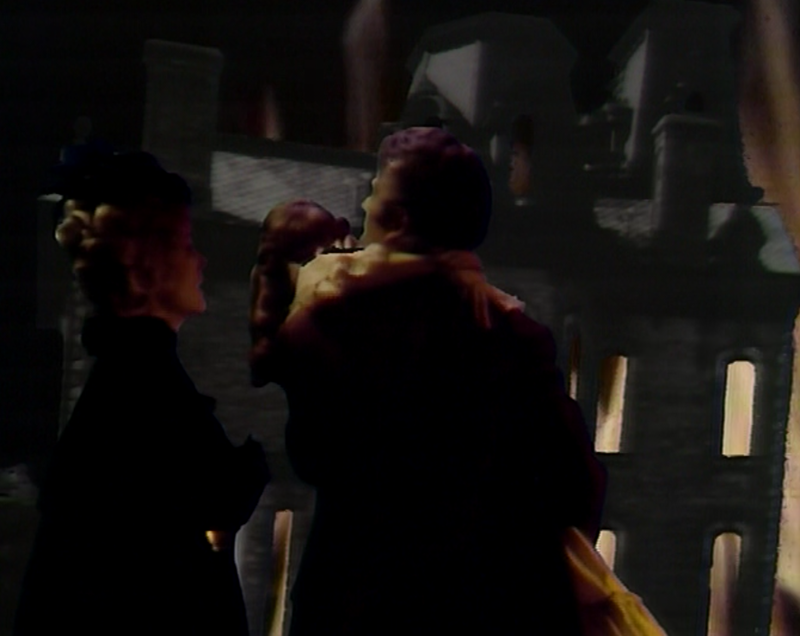 Laura opens the drawing room doors to find Quentin standing just outside. He comes in and pours himself a drink. He notes that burning the school down was a bizarre way to get the children back home. She can't believe he's suggesting that she had anything to do with it. He calls out how fire has played an important role in her life in the past year. Magda returns with tea for Laura. Quentin closes the drawing room doors and stops Tim before he enters. He asks him about the fire. Tim tells him the building was in flames very suddenly, and they were lucky to be alive. Laura tells Magda she needs air. She gets up to go outside and runs into Tim. He tells her Nora is upstairs, and asks to speak to her for a moment. She asks Magda to excuse them. Tim asks her how she got into the room with Nora after the fire began. She makes up a story, which he pokes holes in by pointing out that he was where she said she was, and he didn't see her. She tells him that she'll be telling Reverend Trask about his heroism. She then bids him goodnight, and he leaves. After he's gone, she goes outside. From the top of the stairs, Nora sees her mother leave. She calls to her and follows her outside. Magda sees Nora leave the house, following her mother. Quentin comes downstairs and finds Magda at the door. She explains that Laura left, and Nora followed her. She says that if Laura wants to be alone, she'll send Nora back, and then Nora will be able to tell them where to find her. Laura removes the urn from a hiding space in the garden. Nora appears and asks to see what she has, and Laura shows her. She tells her that if she goes home, she'll tell her a story about the urn. Nora leaves and says that she'll wait for her. After she's gone, Laura opens the urn and speaks to the flame. She asks for energy and sustenance. Magda tells Quentin that she sees Nora returning on her own. She sends him to the drawing room. When Nora enters, she asks her where she's been. She tells Magda that she was with her mother, and when Magda asks where she saw her, she tells her it was in the garden. Magda takes her upstairs. 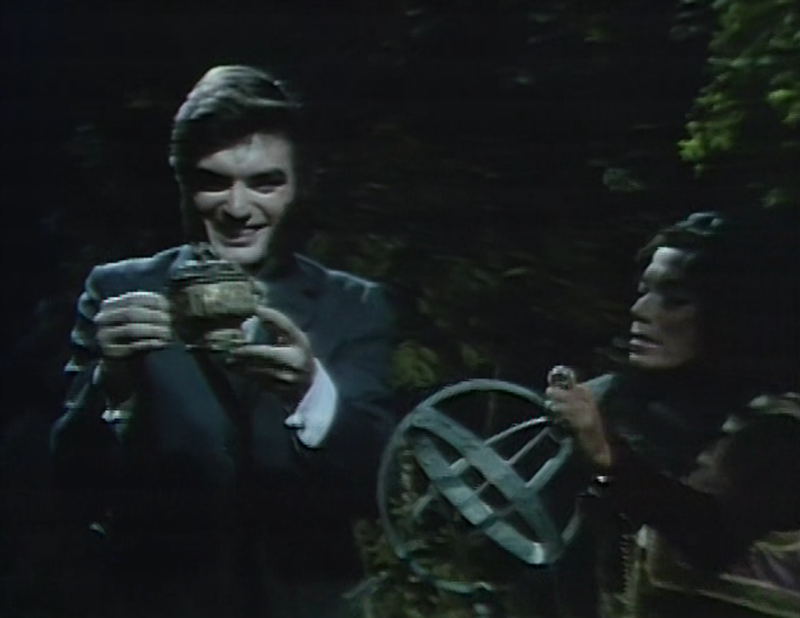 Magda and Quentin search the garden for the urn. Quentin finds her bracelet near a sculpture. He picks up the top of it and finds the urn. Magda is not impressed. He explains that it's a very valuable and precious thing, for it contains a flame capable of giving life. He adds that if it is snuffed out, a life will be snuffed out with it. He wonders how it will happen, and says they'll know soon enough. He pours sand onto the flame and says goodbye to Laura. In Collinwood, Laura squirms in agony. 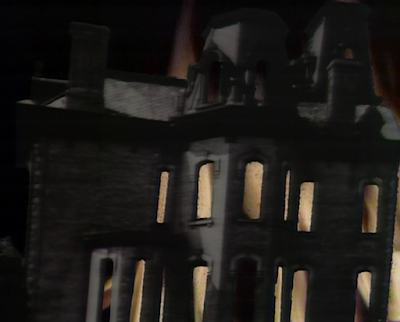 John: The burning school might be our most ambitious failure of a chroma-key effect, yet. 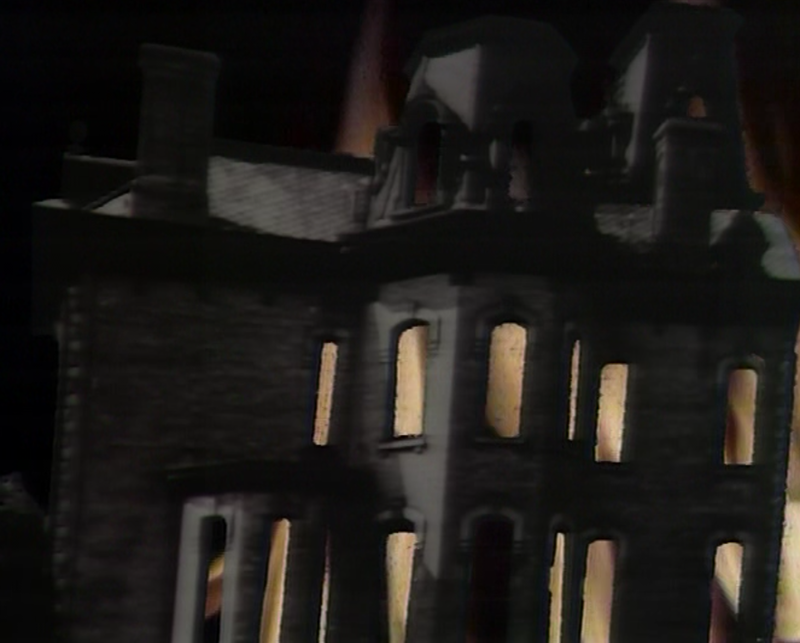 It was like they held up one side of a model house in front of a fireplace, and then had the actors standing in front of the chroma screen! Christine: It was certainly terrible, but the imperfections of this show are what make it so endearing, I'm surprised Nora didn't burn up while Tim took forever and a day to unfold and drape the blanket around himself. 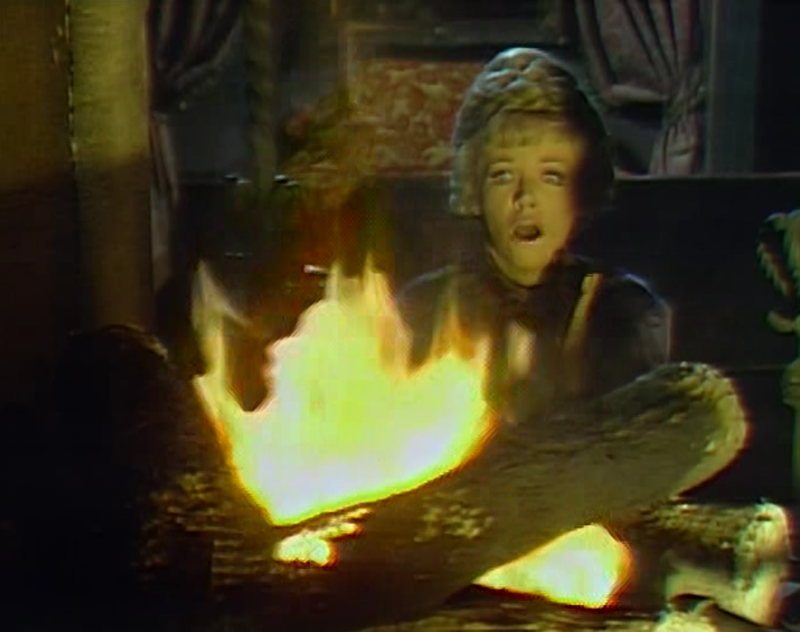 I half expected Laura to walk through the flames and retrieve Nora herself while he continued to fumble with the blanket. 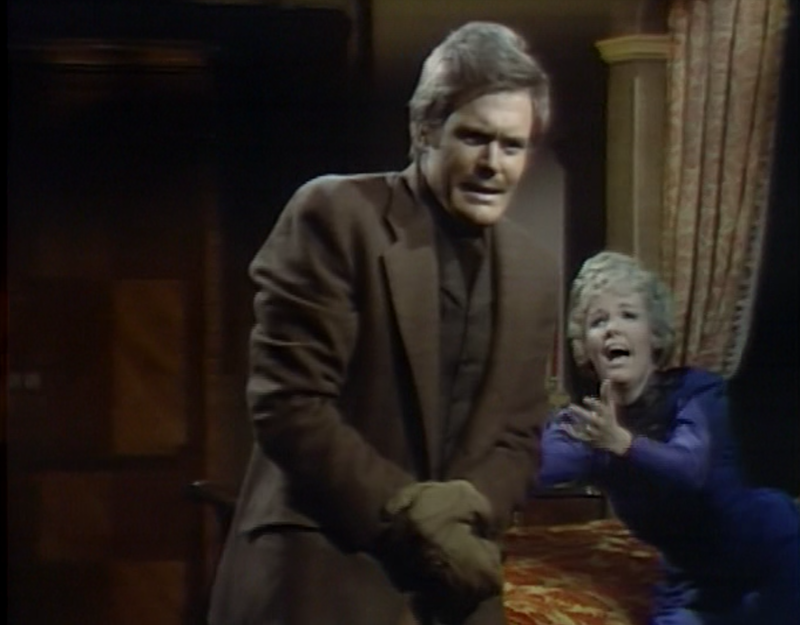 John: Laura insisted that they take Nora back to Collinwood, but was fine leaving Jamison with Trask? You would think that today would have been an important day for both of the kids to be working! 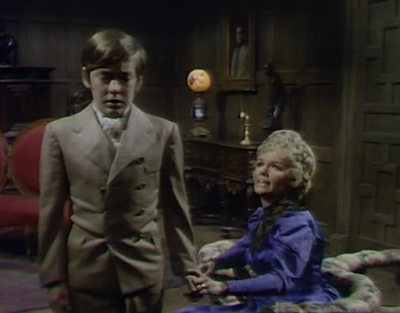 Christine: Surely he told his mother that Trask shoved him in a closet and threatened to have him spend the next day enduring punishment with him. It's easy to see which child is her favorite. John: Well, that was somewhat anti climatic. Quentin snuffed the flame too quickly, and given that it's only Monday, I don't think it's going to have any sort of permanent effect on Laura the Phoenix. I'm guessing that we'll find there are multiple urns 'keeping the flame', so to speak. Christine: I have to wonder if it wasn't a deliberate setup on Laura's part. That Egyptian snake bracelet she has wound around her arm couldn't just slip off and drop to the ground without some help. If so, then Quentin's in for more tortured burning sensations as punishment for trying to snuff her out.